Our range of single seat valves consists of large numbers of purpose-designed valve units that are very robust and flexible. They are ideal for use in processes with a high hygiene standard. LKAP seat valves are reliable air-operated shut-off valves that are widely used for small flow rates and for dosing applications in the dairy, food and beverage industries. They are ideal to handle small flow rates of up to 9 m3/h. 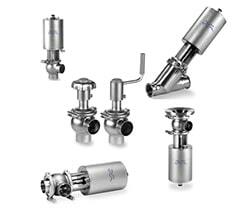 The mini flow valve is an excellent choice when hygienic shut-off or changeover of liquids or gases is required for a broad range of applications in the brewery, food, dairy and beverage industries. Unique SSSV is widely used in processing food, beverages and dairy products, as well as pharmaceuticals and personal care products. Ideal for use in sampling, CIP (cleaning-in-place) and other contexts where only small flow rates are involved. The modularity of the Unique SSV range offers the flexibility to customize valves to your specific requirements. They are pneumatic seat valves used to shut off or change product flow. The surface finish of Ra 0.8µ, the smooth, weld-free valve body eliminates crevices that can trap bacteria. The design of the plug supports enhanced cleaning-in-place capabilities, and a double-acting lip seal that minimizes risks of cross-contamination. The Unique SSV range is EHEDG-certified, authorized to carry the 3-A symbol and provides full traceability in compliance with the EU Food Regulation 1935/2004. Unique Single Seat DN125 (5") and DN150 (6") valves are pneumatic seat valves in a sanitary and modular design offering a wide field of applications, for instance as a stop valve with two or three ports or as a change-over valve with three to five ports. These valves complement the Unique Single Valve family for large size installations in specific areas of your plant where size matters.